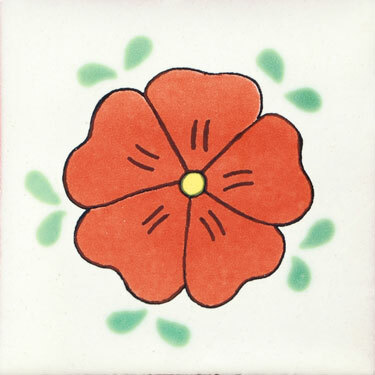 This is one of the traditional Mexican Talavera Tile, with this beautiful Jasmin Mexican Talavera Tile, you can decorate any space in your house, this typical Mexican ceramic clay tile will make your kitchen, backsplash, countertop, look gorgeous, giving a special touch that only Mexican traditional tiles can give. We offer a great variety of patterned Mexican ceramic tiles, These traditional Mexican Handmade Tiles are pieces of art that will be appreciated by all. The rich colors of these Mexican Handcrafted Tiles make them a good option for many applications, when you adquire these Mexican Talavera tiles you are not only buying the tiles itself but culture and folklore, cause these Mexican Handmade Tiles were made by the greatest Mexican artisans.